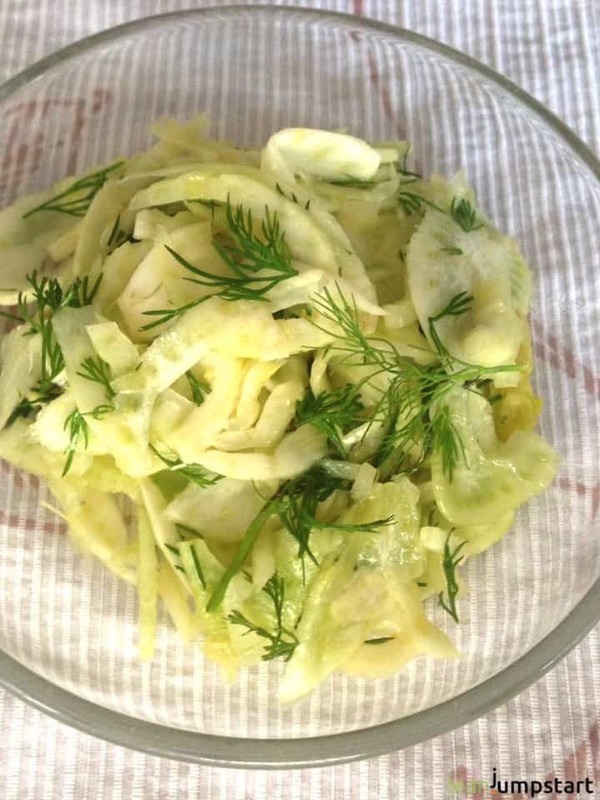 This simple fennel salad recipe comes really handy if you have fennel bulbs in your vegetable subscription box like we often do and don’t know how to use it. Or maybe you are here because you want to learn about fennel’s weight loss properties. Cooking with fennel would be another option but as we love to eat a juicy salad each day, this fennel slaw is a welcome and delicious variation. As clean eaters, we can’t experiment enough with different types of vegetables. I’m aware that fennel is a vegetable not for everyone. Some love it, others hate especially fennel’s taste of anise and licorice. Some people confuse fennel and anise and although fennel tastes a bit like anise it is totally different. See picture at the end of this blog post. But even if you think you don’t like fennel, I recommend trying this simple raw salad recipe and judge again. The mustard in the dressing softens the licorice taste and flavors marry so well. Hint: This bright and crunchy salad loves being paired with dill. Creating this vegetable slaw could be the turning point in your difficult fennel relationship. Here comes the recipe! Don’t miss the 4 weight loss effects of fennel at the end of this post. 2 medium fennel bulbs, thinly sliced on a mandolin or box grater. Make the vinaigrette: Put vinegar, mustard, salt, and pepper in a blender and pulse briefly to combine. Drizzle in the olive oil with the motor running until it is well combined. Gently toss fennel, onions, herbs, and dressing together. Tip: If you have young fennel bulbs make sure to use the tender fennel stems too. I love this served with a simple seafood dish and new potatoes. For variation, you could serve it as a bed for crabs. Fennel salad goes also well with pasta. You can store fennel in the crisp box of your fridge for several days. For freezing, you first cut it in small pieces and then blanch it. With 494 milligrams per 100 grams, fennel is particularly rich in potassium and thus covers a quarter of the daily requirement of this important mineral. Potassium influences the electrolyte balance of all human cells. With its function to control the contraction of the muscles, potassium helps to build muscles and provide endurance and strength to the body. Regular consumption of fennel protects against potassium deficiency and at the same time strengthens the heart muscle. The bulb contains also a lot of vitamin A and almost double as much vitamin C as an orange. Vitamin C works not only as an antioxidant, but it is also essential to collagen, the support system of the skin. This is because vitamin C promotes the ability of collagen to improve the overall texture of the skin and to smooth wrinkles. On top of that, it is a fiber-rich, low-calorie vegetable what makes it really beneficial for you, if you are watching your weight. Click through to learn about the top 30 high fiber vegetables. But there is more. 1. Suppresses the appetite: Fennel is excellent for weight loss as thanks to its soluble fiber it creates a feeling of fullness and tames the appetite. 2. Relieves water retention: A common cause of temporary weight gain is water retention. If you drink fennel tea regularly it helps flush out excess fluids from your body. 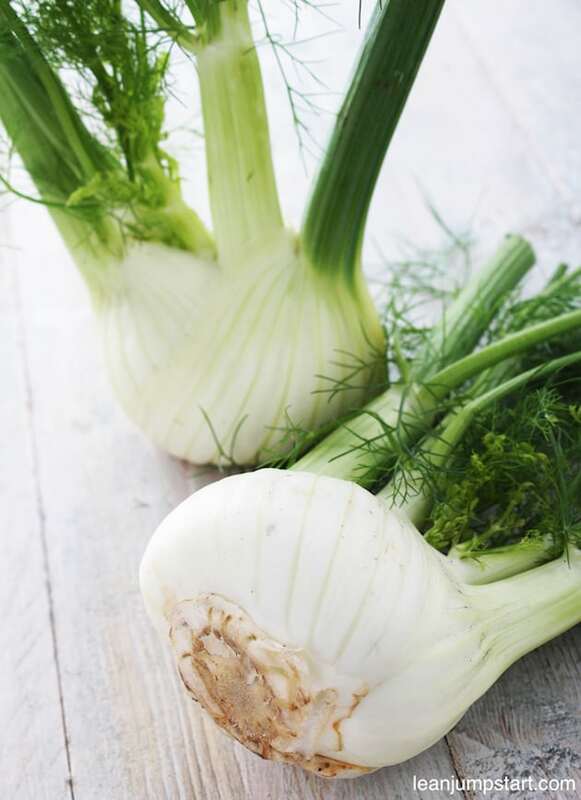 In addition, fennel reduces the risk of urinary tract problems and helps to remove toxins. It also has diaphoretic properties that will stimulate perspiration. 3. Natural fat burner: Fresh fennel works as a natural fat burner by breaking down fat and boosting the metabolism. 4. Aids digestion: This bulb is highly favorable in relieving digestive problems such as bloating, flatulence, indigestion, constipation, colic, intestinal gas, and even irritable bowel. It stimulates digestion and prevents the formation of gas. Moreover, it can help rebuild the digestive tract after chemotherapy treatments and radiation. And what has an improved digestion to do with weight loss? With a better digestion, you assimilate more nutrients from the food you eat. In consequence, your body feels satiated after eating and you will get fewer food cravings. 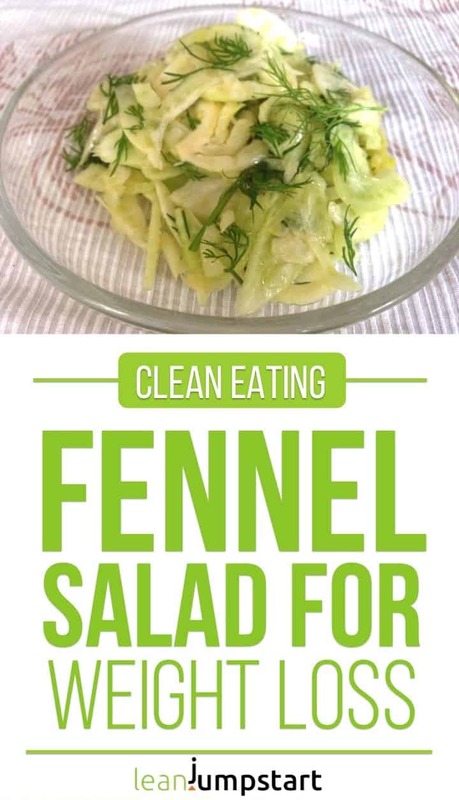 I think especially if you are watching your weight I gave you enough reasons to try this fennel salad. Just let me know how you like it in the comment section below! Do you want to lose weight with a sustainable approach? If yes, then make sure to check out my 52 Chef Habits E-Course helping you simplify clean eating and as a nice side effect lose your last couple of pounds. Click here to learn more!